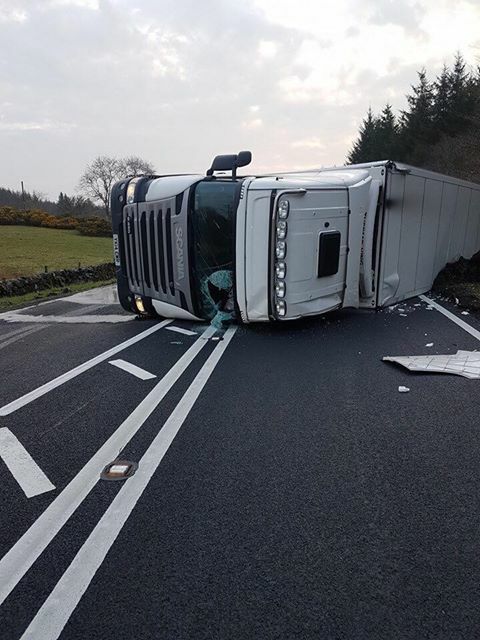 At around 07:10am this morning Sunday, 15 April 2018, the A75 Newton Stewart – Glenluce (A747) at Halfway House Kirkcowan was closed to to an HGV vehicle overturning and blocking both sides of the road. Emergency services quickly arrived on the scene to deal with the situation. The driver allegedly had two passengers onboard one of which was possibly a child. There are no reports of any one being seriously injured, and no other vehicles were involved in the incident. Eastbound. Closure of A75 at Glenluce Bypass (A747) – take right onto A747 and continue to Port William – continue straight ahead 1st exit at roundabout onto B7085 Main Street and High Street – continue to junction with A714 – take left onto A714 and continue through Bladnoch and Wigtown to junction with A75 at Newton Stewart. Distance: 29.7 miles. Westbound, Commence diversion on A75 at Newton Stewart Roundabout (A714) – leave taking left onto A714 – continue to Wigtown on A714 – travel through Wigtown to Bladnoch – remain on A714 – at junction with B7085 take right onto B7085 – continue to Port William – at Main Street continue through roundabout onto A747 – continue on A747 to Glenluce Bypass to rejoin A75. Fire and Rescue arrived on the scene to deal with any fuel spillage. The road will remain closed during the clean up operation. We will post any updates we receive on the DGWGO facebook page HERE you can find out more on the Traffic Scotland website HERE.